A prominent sociologist told the Los Angeles Times, “The Communist Party’s propaganda office is promoting him like he is a god to give the young generation something to believe in. That’s why people go to Shaosan, because they talk of Mao as their god.” Many of those who admire Mao the most are the once who are suffering the most in modern market-oriented China. In the village of Gushuicun in Shaanxi province, peasants have erected a temple honoring Mao, where comrade worshipers and high party officials come to light incense and burn paper money in front of a 10-foot-high plaster statue of the Mao. In Gansu, thousands of villagers came to see a roadside tree stump after rumors spread it bore a likeness to Mao. In other places, farmers clutch buttons and photos of the chairman after devastating floods the same way Chinese Buddhists used to do with images of Guan Yin, the Goddess of Mercy and taxi drivers hang Mao portraits from their rear-view mirrors to ward off accidents and bring wealth. For the government some of this adulation has gone to far. In Mao’s hometown postcards picture Mao with a halo have been seized and Buddhist-style temples, where visitors prayed before images of Mao, have been shut down. Maoism remains alive and well in Nanjie, a village in Henan province with 3,130 residents. Here, soldiers goose step past a Mao statue while loudspeakers blare out the Communist Party anthem The East is Red! ; women with balloon-seated pants and Mao buttons do calisthenics in front of huge Mao posters; and foot-tall porcelain Mao figurines grace new apartments. The village even has a miniature version of Mao's mausoleum. In Nanjie, there is no crime, unemployment, or unplanned children. Everyone lives in an identical free apartment, earns the same salary (about $35 a month in the early 2000s) and receives free health care, insurance, utilities and free foodstuffs like flour, eggs and cooking oil. Families that lose stars according to a 10-star good behavior system lose privileges. Weddings are held in a group ceremony on January 1st, children attend school from 5:35am to 8:00pm, and social life revolves around political study classes. In the late 1980s, Nanjie was a poor village like tens of thousands of others in China. After Tiananmen Square when hard-liners in the Communist party felt that Mao's image needed sprucing up Nanjie suddenly found itself the recipient of $54 million in low interest loans and 11,000 low-paid laborers to run its factories. Now the residents live in new houses with telephones, refrigerators, washing machines, and color television sets with cable. They are also provided with new sets of clothes twice a year by the government. The $500,000 main street is lined with rocket-shaped street lights that cost $360 a piece. The villages $2 million kindergarten has granite walls and an electric gate. Up to 250,000 tourist visit Nanjie every year. Mao’s image is on almost all the banknotes. If you fold up the currency in just the right way and move it, Mao’s expression will change from a smile to a frown as you move the bill up and down. In fancy nightclubs, singers do disco versions of Mao's poems. A satellite lost in space was reportedly carrying a Mao medallion studded with 44 diamonds. Shops in Hong Kong sell velvet Mao caps, chartreuse Mao jackets, Mao watches, with the Great Helmsman's hand waving every second, and Mao cigarette lighters that play the "The East is Red" when they are opened. The Italian designer Prada had great success with Mao jackets in 1998. Boxer Mike Tyson has a Mao tattoo. Boxing promoter Don King said, "I'm just honored to be in his presence--- when he visited Mao's mausoleum. In the 1970s Andy Warhol did a series of Mao prints and is credited by some with being the first person to make Mao cool outside China. 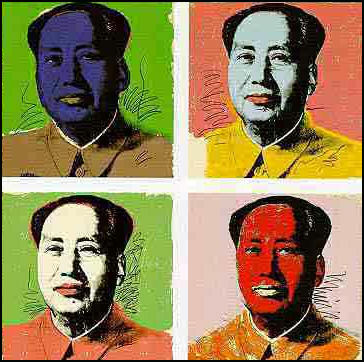 In November 2006, a rare Warhol silkscreen portrait of Mao was sold for $17.4 million to an anonymous bidder. Pop art portraits by Chinese artists show a grinning Mao surrounded by advertisements for Maxwell House Coffee, Kodak film, Marlboro cigarettes and other popular consumer items. Cultural-Revolution-themed restaurants feature Mao pins, Mao clocks and newspaper clippings with headlines that read "We [students] want to go to the country to raise food ourselves." Shaoshan is now one of the richest towns in Hunan Province. The town features a half dozen hotels and a Mao museum and is full of busy restaurants and souvenir stands that sell bronze busts of Mao for $85, Mao snow globes for $7 and Mao key chains for $4.25. Shaoshan only has a population of 1,387 people, with many claiming to be long lost Mao relatives, among them the founder of Mao’s Family Restaurant chain. In 2009, the 60th anniversary of China’s birth, 3.5 million visitors show up to honor Mao. In a 2009 film, Mao was depicted a jolly fellow whose only apparent flaw seem to be once getting too drunk to celebrate a battle victory. “But apparently China’s foremost revolutionary can be a spectacle of bling. The statue of a seated Mao went on display in Shenzhen, a commercial city in southern China better known for its raucous nightlife than its spartan revolutionary spirit. China National Radio said on its website that the figure of Mao — appearing unnervingly slim — was covered in gold, jade and other gemstones, and was the work of more than 20 master craftsmen over eight months. The whole ensemble, including the 110-pound statue of the man and a white marble base, cost about 100 million renminbi to make, according to the craftsmen. The report did not say who sponsored or paid for the work. “When the gold flashes, it captures the intense interest of the public,” noted the report. The statue went on display at an art and handicrafts show in Shenzhen, but will find a permanent home in Mao’s birthplace, Shaoshan, in Hunan Province. “Some have criticised the statue online, for the perceived waste and what they see as the statue's insensitive location. But many others have leapt to its defence. Despite being responsible for so many deaths, Mao Zedong is revered by many in China, not least by President Xi Jinping, who praises him as a "great figure". Since the early 1990s, products with likenesses of Mao have become all the rage in China. 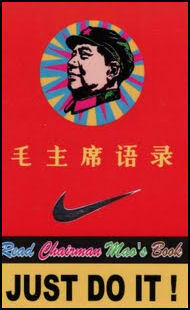 The chairman's face can be found on lockets, T-shirts, tie-clips, seat cushions, alarms clocks, key rings, thermometers, towels, sun visors, cigarette packs, yo yo's, telephone cards, laser disks with Mao speeches and busts that glow in the dark. Some of the stuff is quite expensive. Mao watches with diamonds and sapphires that sold for $1,500 were so popular that supplies ran out. 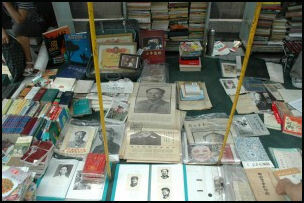 Mao-era memorabilia is quite valuable. Some Cultural-Revolution-era badges are worth thousands of dollars. Mao wool banners have fetched $5,250. A first edition of the Little Red Book. with an endorsement by Lin Biao, was sold at an auction for over $15,000. In 1995, an oil painting of Mao Zedong sold at an auction sold for $361,000. Most of the memorabilia is fake. The first Mao badges were made from discarded toothpaste tubes. Now they are manufactures in capitalist-style assembly lines. Stuff that was common in the Mao era is now rare. In many bookstores in Beijing you will be hard-pressed finding a copy of The Little Red Book. Ross Terril wrote in the Washington Post: "But among ordinary citizens, 'Pop Mao' is a subtle mockery of the whole box and dice of Communist politics. It is also a symbol of commerce dethroning politics. That Mao is one of the ingredients tossed into the casserole of the market is itself a joke at the expense of socialism. (To compound the joke, many of the traders who market the portraits and busts and cassettes are former inmates of Mao's labor camps.)"